The New York Green Advocate: The New Eco Lifestyle Web Site SHFT Heralds a New Kind of Green. Or Maybe We Should call it Post Green. Or just skip Green altogether. The New Eco Lifestyle Web Site SHFT Heralds a New Kind of Green. Or Maybe We Should call it Post Green. Or just skip Green altogether. There's a Paradigm Shift in World Consciousness regarding the Environment going on right now. But, it's so 20th Century to call it a shift. SHFT is so much better, post Y2K. And, yes, this shft towards a more sustainable culture is about being green. But, maybe, our green days have had their day (Don't take this personal Green Day). I distinctly noticed that the SHFT press material, which has the tag line "Curating the Culture of Today's Environment", did not highlight or stress the word green. I thought this most interesting given SHFT was being promoted as a web site about the planet's current environmental awakening. The look and feel of the beta web site was immediately intriguing. The cover page of the web site was gray actually - and depicted an anonymous gray wall somewhere. Maybe the wall was in Europe, Montreal, Singapore. Could it be New York? It felt foreign and familiar, very understated, like a neighborhood East Village NYC bar without a name or street sign, but a place that everyone seemed to know about any way. This anonymous gray wall almost begged to be tagged by the latest graffiti artist a la Bansky. The bold, graphic colored text SHFT actually seemed like a graffiti tag - calling out with its street-chic misspelled mystique. 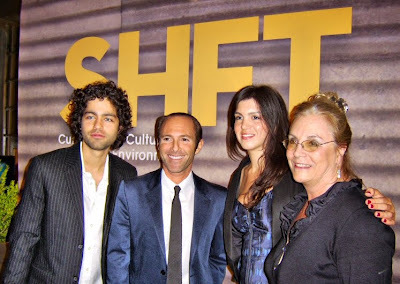 Founded by Adrian Grenier and producer Peter Glatzer, with Stonyfield Farm and Lauren Gropper as Founding Partners, SHFT.COM "offers curated shopping, original viral video focusing on art and music, and a host of resources that speak to a modern, eco-conscious lifestyle." I liken it to a marriage of "TreeHugger" and "Dwell" -something that mixes up the medium with the message in a way that is fresh AND opens the door to a new way of proactively celebrating the environment without ominous-peak-oil-the-Arctic-ice-shelf-is-melting-Armageddon-like proselytizing." 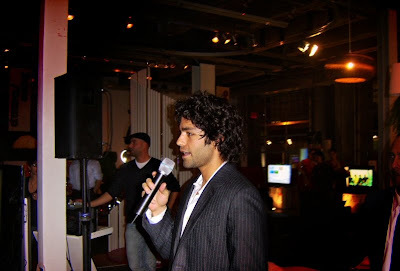 Adrian Grenier, sans entourage, talking about SHFT and introducing producer Peter Glatzer. The coming out party for SHFT took place at the WIRED Pop Up Store in the Meat Packing District of New York City. Despite the fact that the sprawling space was filled with a fairly large group of some of the most connected people in the environmental, media and entertainment world, the "E"vent seemed intimate and anything but "wired." The super-connected yet low-key energy was wi-fi cool - laid back, with a purpose, full of intent with a super mellow bent. It was easy to wander over and talk to Adrian Grenier as there was no high-octane, rat-pack kind of entourage in sight. 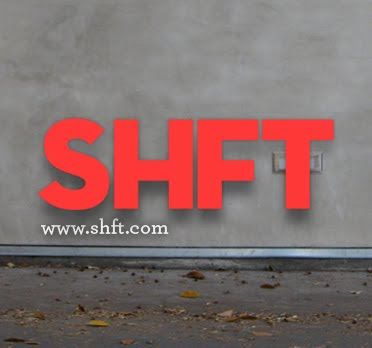 When I remarked how cooly subdued the SHFT site was and how much I loved the empty gray wall graphic, Adrian calmly enthused: "We've been moving full steam ahead on a destructive path. We need to downshift. You can't go up a hill in fourth gear." Considering what he said about shifting to a lower gear, I thought to myself, well, there is the Sundance Channel's Lazy Environmentalist, (aka Josh Dorfman, thank you--very much), and now there is Adrian Grenier, the Laid Back Environmentalist. Yes, Adrian and SHFT might be laid back, however we're not talking about tuning in/turning on/dropping out style laid back. We're talking laid back with meaningful finesse as opposed to being so laid back that your mission, good form and design are thrown out the Prius window. 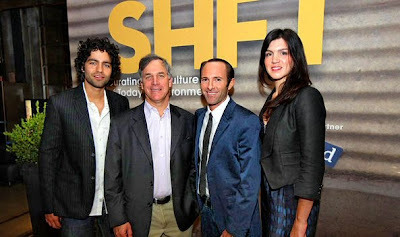 Adrian Grenier, producer Peter Glatzer, architect Lauren Gropper and Pamela Lippe, founder Earth Day NYC. I asked Adrian how involved he was in the "curating" of the content and the products sold on the SHFT web site. He and his friends who started the site, Adrian answered, all had a similar sensibility and it all seemed to come together organically like it should. Elaborating, he explained how they curated some of the green products sold on SHFT: "We are looking for unique, cool stuff. Not wholesale kinds of things. One of a kind of things. Something you can actually use. Use over and over. Not throw away tomorrow." He stressed that the SHFT style, in addition to having some practicality, must have originality and beauty combined with function: "If it doesn't have a great design, and a beautiful form...."
The SHFT web site states that Adrian and Peter founded SHFT "to build a platform that uses media to curate the myriad sustainable choices now available to us and to highlight the cultural shift taking place. Their philosophy is that living an eco-conscious life shouldn't be devoid of good design or good times; that we are in the midst of a shift towards a more sustainable culture where "environmentalism" will be seamlessly folded into the fabric of our lives." 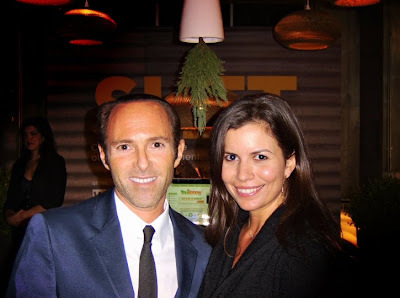 And, speaking of functionality and beautiful form - one of the first people I ran into at the SHFT launch party was Seth Grizzle from Graypants in Seattle. Their elegant, upcycled cardboard lamps called Scrap Lights were hanging in the SHFT team's curated green section of the WIRED store. The Graypants' lamps fully demonstrated what Adrian was telling me about SHFT's focus on products that combine beauty with environmental sensitivity and practicality. Recyled Cardboard is transformed into glowing sculptures, capturing the eco mind-SHFT going on. 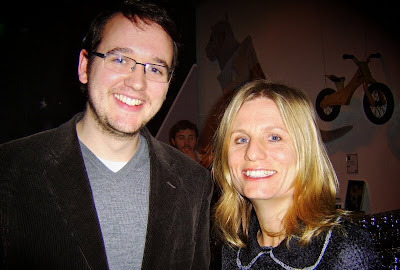 Originally, I met Seth Grizzle at a party for the International Contemporary Furniture Fair at MOMA last Spring. I knew when I met him that he was on the cutting edge of our environmental zeitgeist. Seth was accompanied this evening by Alina Munoz who co-founded Culintro, a Culinary Trade Organization. Alina and I made plans that night to talk further about organizing some restaurant events in NYC involving local farms and chefs. 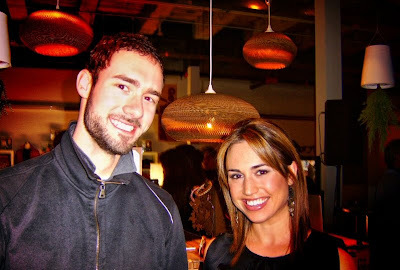 Graypants' Seth Grizzle and Culintro's Alina Munoz. Standing in front of Graypants' Lamps made out of cardboard. So is Green Dead? Passe? Fini? Since the title of my blog is "The New York Green Advocate", it might seem a tad incongruous that I am asking if using the term green is outdated. Am I outdated? Am I just a CFL light rather than LED? DVD never to be Blu Ray? But, seriously, the "is green getting old" question is an issue I have noticed being talked about in the "green camp" for several years now. I think part of it is that some of us eco activists have become slightly bored, realizing we are on to a good thing, but wanting to manifest a new improved version of our eco conscious selves. Luckily, while at the SHFT shin dig, I ran into Pamela Lippe who founded Earth Day NYC in 1989. Pamela has a long track record of activity in the environmental movement. Few people have as much insight and perspective on the environmental movement over the past three decades as Pamela. I was intrigued to learn from Pamela, in the spirit of reinvigorating the aforementioned eco conscious selves, that Earth Day 2010 in NYC will be called EDAY40, marking the 40th annivesary of the founding of the first Earth Day events. EDAY40 will launch an E campaign "to put a fresh face on and draw new people into the environmental movement." The aim to "promote a new symbol of hope and commitment" and inspire continued E activism in everyday lives echoed the message of the SHFT launch party. All who attended the night's festivities surely seemed in eco sync. But, does the green movement, in fact, need a new hue? It's not like the U.S. Green Building Council or Greenpeace or Greenorder or Green Globe or one of the many many green groups or companies like Planet Green are going to change their names. Are they? I asked Pamela: "Is the best way to be "green" now to change colors? Is green over, done with, kaput?" Pamela responded with a laugh: "No way ... Green is going mainstream. It is time for green to become standard operating procedure." She made me realize - Green isn't going anywhere. And neither was she! 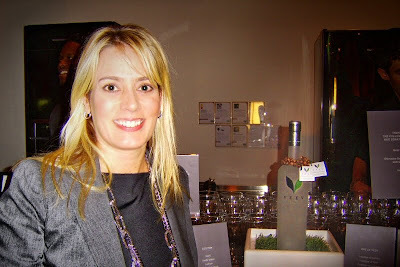 Killy Smith from VEEV,a beverage sponsor for the SHFT launch. Just like packaging needs to be re-designed to be more green, maybe it's good the green movement is rebranded to be, well, maybe less "green". But, you know, green isn't going anywhere even if it changes colors. It's not like us greenies have reached a dead end and have to throw the green baby out with the Seventh Generation bathwater. As Gary Hirshberg remarked at the SHFT launch: "We got into this mess (our relations with the planet) through a whole series of unconscious steps. And, that's how we are going to get out of it. We're not on a dead end. We're on a cul de sac." The whole point is to keep driving. Keep on trucking. That's the whole essence of what SHFT really is - keeping on keeping on. Keep on SHFT-ING. And, keep caring. As Lauren Gropper pointedly clarified regarding the SHFT focus: "At one point we were thinking of the slogan: "Do you give a SHFT?" Being green is not about the word green. Just like we can't be labeled by the underlying meanings of our birth names. Life is defined by the process of living. The process of being. The process of change. How do we curate our life? What do we fill it with? What do we leave behind? The whole point to the eco zebra we call life is that life has many stripes and can change color. Green was green. Then green became the new black. Then Blue was green. Now gray can be green, if it wants to. Peter Glatzer and Keleigh Thomas from Sunshine Sachs. There's a SHFT-load of great stuff on SHFT including videos on the greening of the music industry with the Honey Brothers that you should check out. And, look for the SHFT original animated short called "One Belongs" from Liz Klein. The animation is descibed as "surrealistic animation which beautifully juxtaposes the undersea movement of a jellyfish and a plastic bag, offering some poignant commentary on marine pollution in the process." See, blue is back as the new green. I'll have to call crusader, explorer, legendary oceanographer - lover of our blue planet Sylvia Earle and tell her not to put her scuba gear in the closet just yet! Check out the Fortune video below where Stonyfield Farm CEO Gary Hirshberg talks about Stonyfield Farm's efforts to reduce its climate footprint.